This is something I should have posted earlier, as it is the first mani of the year. One of my resolutions for 2012 is to use up as many of my beauty products as I can. 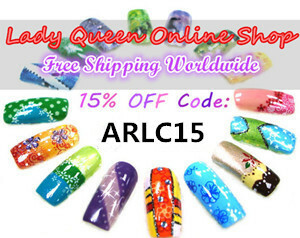 That includes of course nail polishes and nail art supplies. I have a tendency to collect nail art stickers and to never use them because they are so cute. This has to change, so for this year I vowed to use as many as I can. Putting that into effect here are the nails I did for the New Year. My theme was metal and stars. My base colours were Stargazer silver chrome (which happens to be my first metallic nail polish, I have this bottle for over 10 years) and Models Own Thunder & Lightning. Then I added purple and black star decals and Models Own Purple Haze! When I first took out all the bottles, I wasn't sure of the end result but my nails ended up looking fabulous and sparkly, so I can say the experiment was a success. looks like a shooting star mani :D love it. but btw, nail polishes do last much much more than make up, so don't worry too much actually! Lovely nail art! The same happens to me, I buy a bunch of nail polish/nail art stuff but I rarely use most of them. I adore these nails! So cute! Do you use a gel polish dryer to dry your nails quicker? That's actually a great resolution. I guess, a lot of us (including me) should do the same.